Today, Blakely Harbor - once home of the 'largest sawmill in the world' - is a quiet Bainbridge Island neighborhood, an ideal spot for boating, picnics, and birdwatching. Andrew Price Jr., who has spent most of his summers in a home adjacent to Blakely Harbor, has long been fascinated with the area. 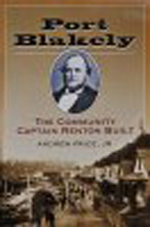 In 1989 he published Port Blakely: The Community Captain Renton Built. The book is a meticulously researched account of the history of Port Blakely, based on countless hours of interviews, old newspapers and company files. Put together, the individual strands of the story reveal a vivid picture of life in the late 1800s, a bustling mill, a busy harbor, and a vibrant community surrounding it all. Says the Bainbridge Review: "The book shows that Port Blakely was a large mill that created thousands of jobs and delivered lumber all over the world, building the Panama Canal, the docks in Honolulu, Tokyo Bay and all over the Pacific. It was also a magnet for people that built a very complex society. The mill is gone but those people are still here and it's why our community is unique. It was more than a mill cranking out wood. It's what built the island." 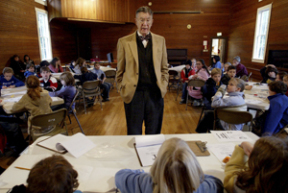 The book is now in its second edition, published by the Bainbridge Island Historical Society.